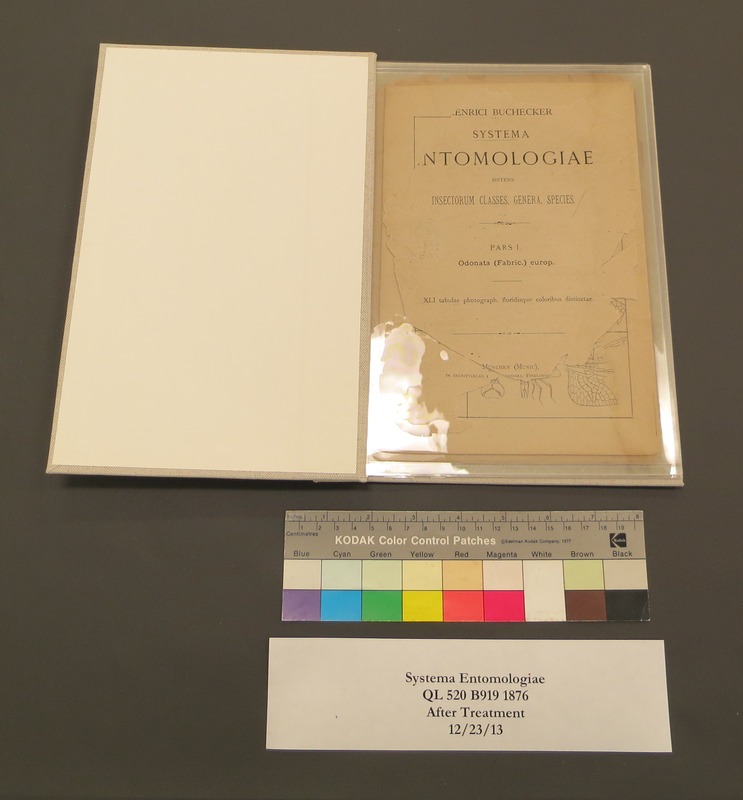 Last year a book came into the Book Conservation Lab as part of the Smithsonian Libraries Adopt-a-Book program. 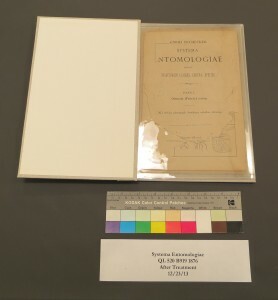 The book, Systema Entomological by Heinrich Buchecker, was in two distinct pieces – text and plates. The color lithographic plates, depicting dragonflies, were printed on paper that is a higher quality than the text. Unfortunately, the text is printed on highly acidic paper that has become brittle with age. Usually the decision to post bind is a difficult one. 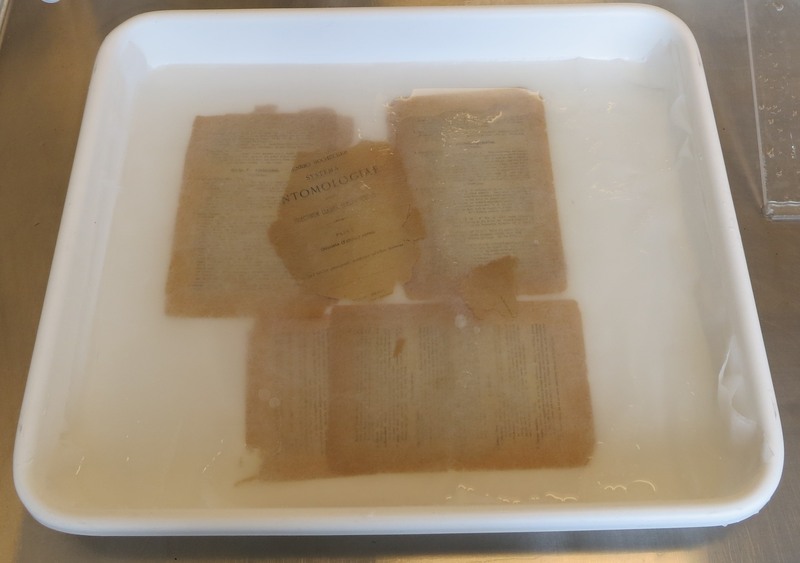 Book conservators strive to retain as much of the original binding as possible in their work. A post binding is a last resort solution for books with extremely brittle paper – allowing them to remain in use to the researcher. As this set came to us unbound, the decision was easier to make. 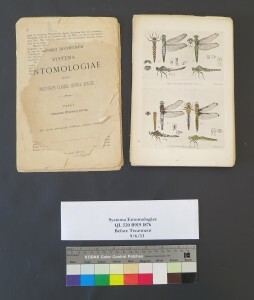 Because the paper used for the text and plates was of different quality, the decision was made to treat the pieces as two distinct parts. The text was deacidified in a de-ionized water bath and then placed in a second bath of Calcium Carbonate to buffer them. The text was then dried, flattened and encapsulated in Mylar sheets. Mylar is an inert material that will protect the text and allow it to be handled without causing further damage. The plates were dry cleaned on the verso side using eraser crumbs and placed in Mylar L-Sleeves. The text was then post bound into a new binding. In the post binding process, Mylar enclosures are created with an extra flange at the gutter edge. A cover is created with the same width hinge as the flange. Then the boards and the flange are drilled and brass posts are inserted to hold the binding together. The plates were left loose but a protective enclosure was created to house them. 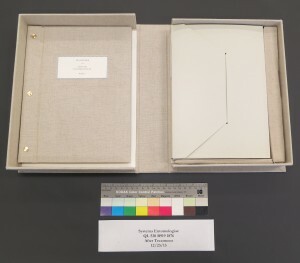 Both the post bound text and the plates were then housed in a clamshell box. 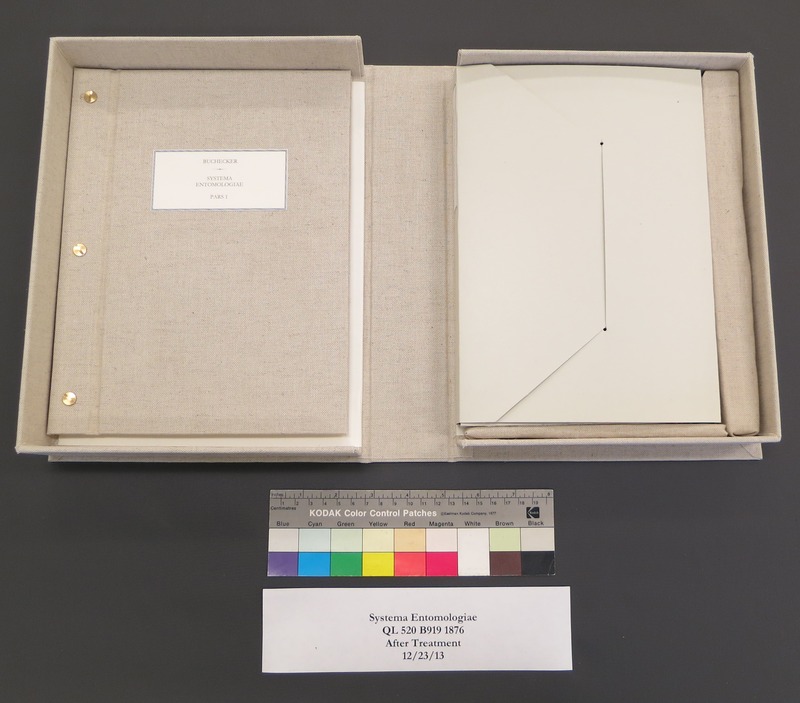 With the Mylar as protection the plates and text can be viewed by researchers without causing additional harm.